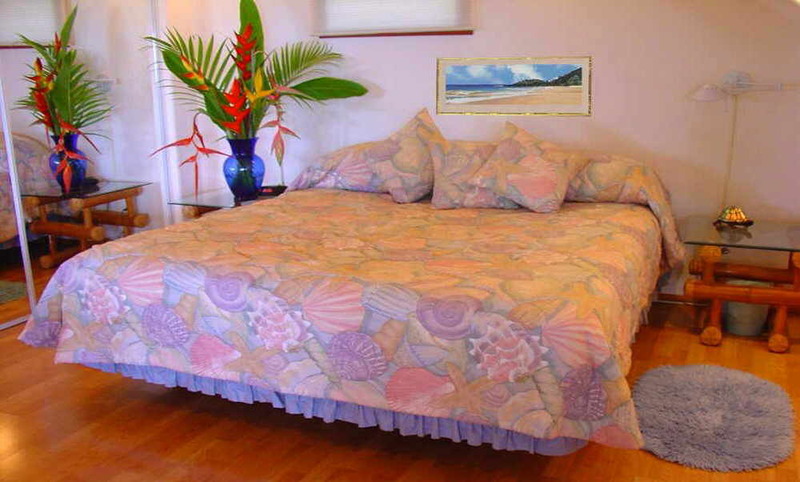 The air-conditioned Tradewinds Suite is the ground level of your hosts' two-story pole house. 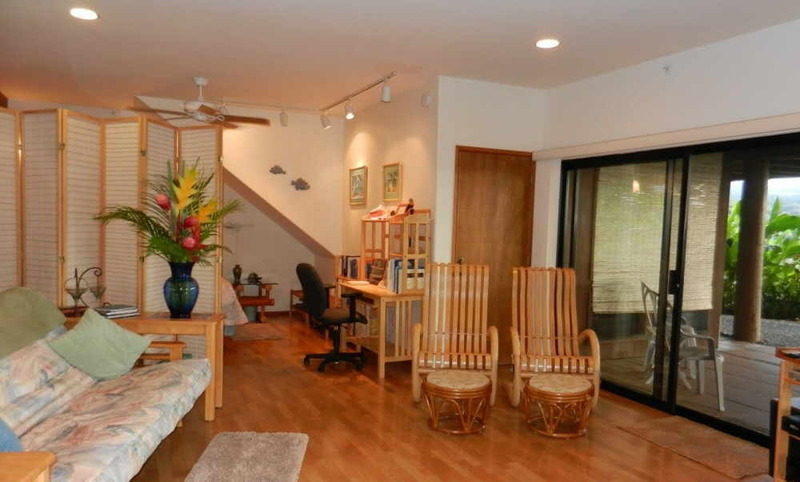 The Suite is popular with Maui honeymoon couples. Your hosts, who are health professionals, are completely respectful of your privacy. However, if you have any questions about your honeymoon vacation accommodation or require assistance with directions, your hosts are available. Please visit our Amenities page for more information on our services & amenities. Click on images to display full-size pictures. 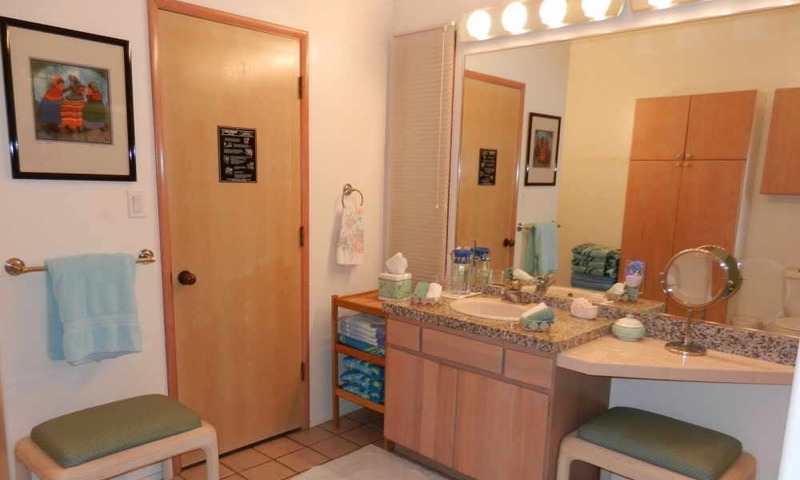 Tradewinds Suite is ideal for a couple, but it can accommodate up to four guests. 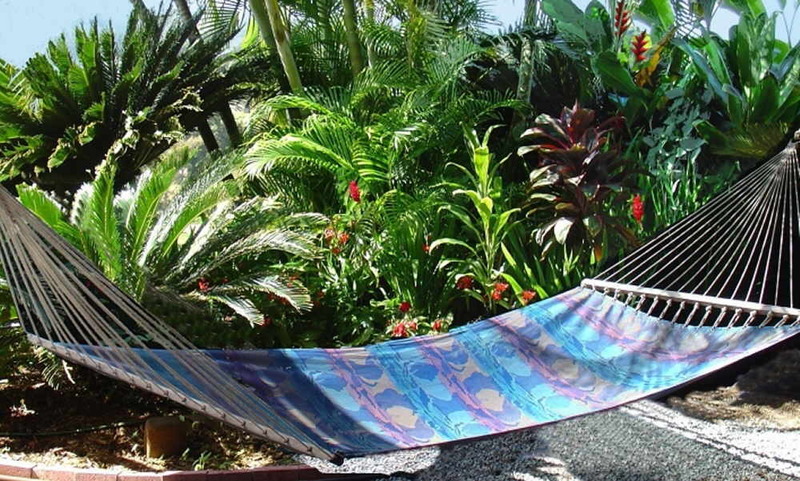 Paradise awaits you in your private tropical garden, among fragrant and exotic blossoms. 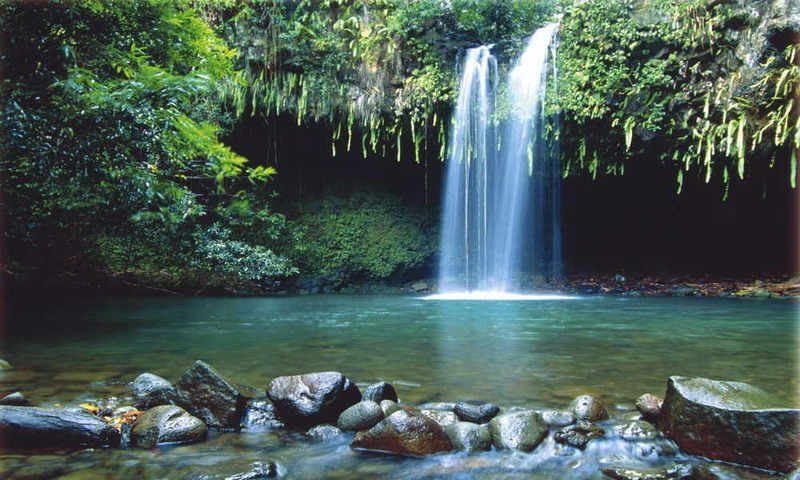 And on the jungle road to Hana you may catch a glimmer of rainbow in a waterfall. The private honeymoon Suite encompasses 1000 square feet of living area, including 30 feet of picture windows and a covered lanai. Floor-to-ceiling mirrors and soft cove lighting add dimension and an intimate atmosphere. Here you will find beauty, comfort, convenience and privacy. There is an ultra-plush Cal-King-sized bed, a Queen-sized futon, and air mattresses are also available. Children aged seven or older are welcome. 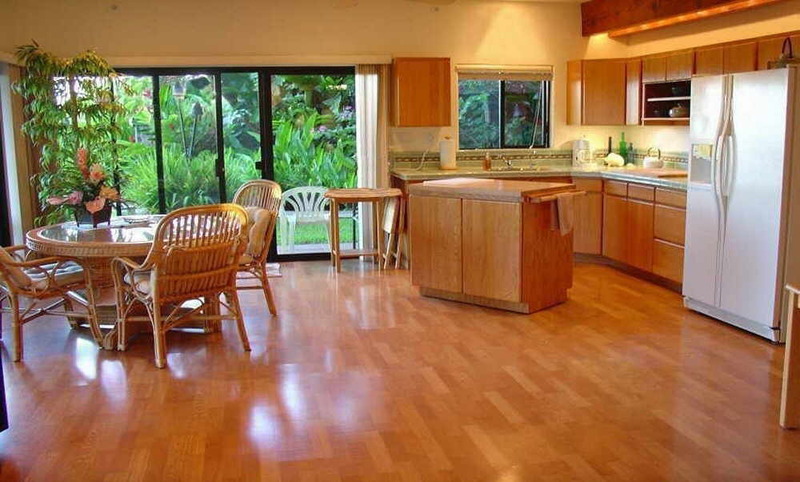 The kitchenette is on your covered lanai. (Why?) It features a portable gas cooktop and microwave, along with a coffee maker. The Suite is equipped with ceiling fans; trade winds also provide ample ventilation. 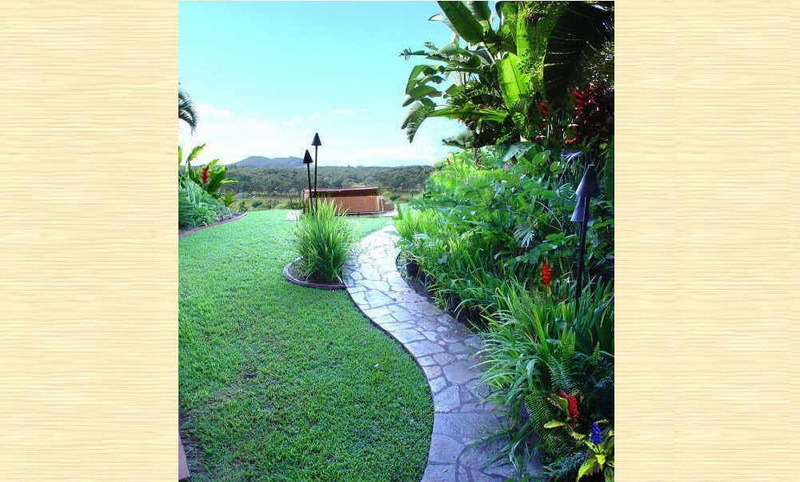 Outside your door is a tropical garden with exotic plants and flowers. Follow the meandering path to your private Jacuzzi. Relax, luxuriate in the outdoor shower, or enjoy a BBQ when the evening turns cool. The full private bath has a shower/tub and a sauna which can be used with dry heat or steam. Your private Jacuzzi with ocean view. The garden and spa are yours exclusively. Enjoy a panoramic vista from the Pacific Ocean, across the rain-forests of Haiku Valley, to the 10,000-foot summit of Mt. Haleakala. Watch sunset over the neighboring island of Molokai. Tiki torches are lit at dusk, as they were in ancient times. 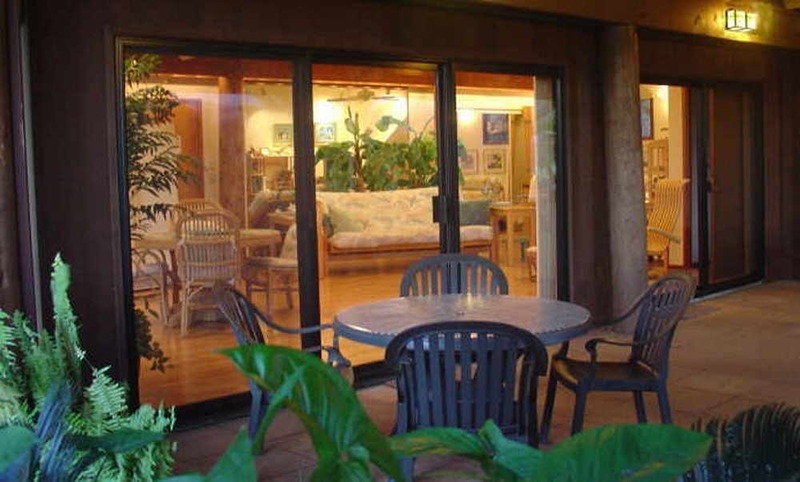 Maui Tradewinds® has become a popular Maui vacation spot on the North Shore, so advance reservations are recommended. We accept reservations of three nights or longer. If you have any questions, or if you prefer personal assistance with your reservation, please contact us directly. 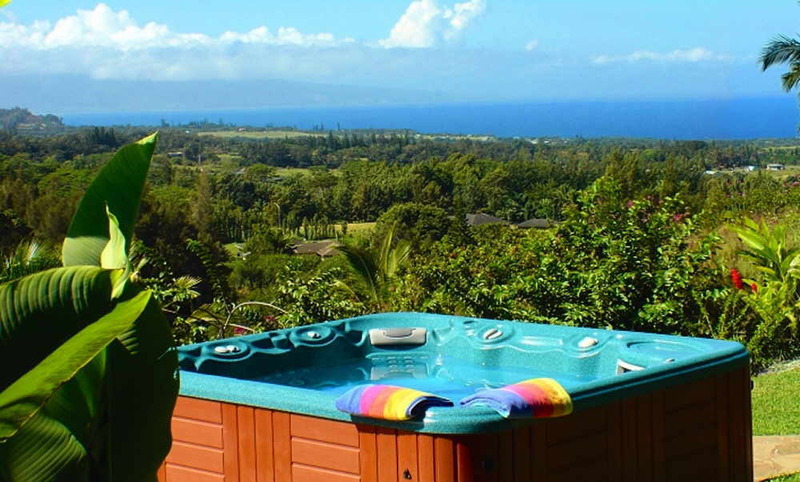 Kindly review our Maui vacation rental policies before submitting a reservation request, as there is a charge for cancellation within ninety days of scheduled arrival, which is refundable if we can re-book the vacancy. Website created and maintained by David Dantes. Text, photographs and graphics (except TripAdvisor and MCC logos, Hawaii State and Maui County emblems) are Copyright © 1998-2019 David Dantes "Maui Tradewinds" Reg. U.S. Pat. & Tm. Off.